So I’m eight months into my first NGO fundraising job. I’m enjoying it, but the translation of genuine human need into effective marketing sometimes makes me feel cynical and complicit. We were having a discussion the other day how to best communicate our issue in few words and strong images. We’re trying to strike a balance between enticing people to donate and ensuring that we aren’t manipulating them or blowing our issue out of proportion. Convincing people to support your organization isn’t the same as selling them a bicycle or a spatula. There are actual human beings at the receiving end of the work we do, and I think that gives us an obligation for truth, sobriety and maturity in our communications that we don’t share with conventional marketers. I’m not offended or disappointed by this, exactly. Unicef’s a great organization, and if we all spent 200 bucks a year supporting them instead of updating our iPods or whatever, the world would probably be a better place. It’s just funny, in an inevitable sort of way, how marketing turns everything it touches into camp. Or in other words, don’t hate the player, hate the game. Unicef is officially a ‘competitor’, so I clearly need to rise to this standard. Is that baby available for a photo shoot in Berlin? I’ll contact his agent. 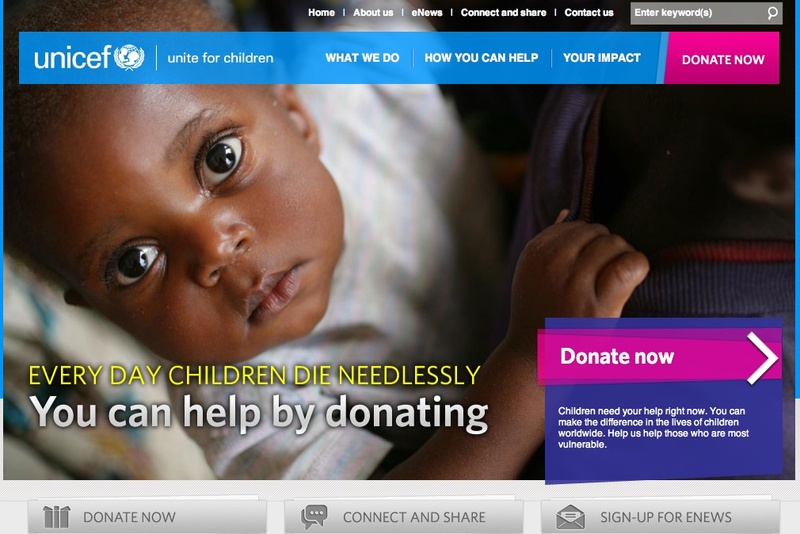 I don’t know that donating to UNICEF in particular, instead of updating our istuff, the world would be a better place. I would rather donate my time and/or money to a local women’s shelter where I can actually SEE my contribution help. If I can’t see it I don’t want to donate to it. There’s too much deception out there and I’m so tired of it, and I don’t trust major organizations anymore. I’m tired of being put on the spot every time I go to swipe my card somewhere if I want to donate to this charity or that cause.This is my perspective and if you look at it from my point of view see if you can come up with marketing that would change my mind, because a lot of people feel the same.